Ages 4-5 Pre-Kindergarten Wooden Unit Blocks Booster Set for homes, home schooling, home-based childcare, or family unit block play with 57 blocks in 14 block shapes specifically designed to support construction, tactile learning, and dramatic play for children ages 3 and up. Of course, all our wooden blocks are infant- and toddler-safe, suitable for ages 6 months and up, so you don’t have to worry about younger siblings putting these blocks in their mouths. Our wooden blocks are completely free of borates, pesticides, and fungicides commonly added to rubberwood after harvest. We use only 100% Hard Rock Maple. We manufactured each block in the United States from Custom Milled FSC®-Certified Hard Rock Maple. Each block is accurately cut to within half of 1/100 of an inch. This 55-block set adds more block quantity to your existing set, including 18 of the basic Standard Unit shape and additional specialty shapes (like triangles, planks, and curves) to support more complex building block constructions and dramatic play. How our Standard Unit Blocks grow with your child. Purchase the CP01 Starter Unit Blocks Set any time before or after your child’s first birthday. Option 1: Add 4 large Unit Block Booster Sets over the next 4+ Years. As annual holiday OR birthday gifts. Option 2: Add 3 large and 4 small Unit Block Booster Sets over the next 3+ Years. As semi-annual holiday and birthday gifts. Option 3: Start with a larger set and add 3 large Unit Block Booster Sets over the next 3+ Years. If your child is a little older, you can start with an Introductory Family Set and still get create a meaningful annual holiday or birthday gift tradition. When you are done, you’ll have a full CP61 Quarter Classroom Unit Blocks Set + RX10 Quarter Rx Unit Block Set. The Hard Rock Maple Unit Blocks that you buy today become tomorrow’s heirlooms and antique wooden toys. Compare Our Hard Rock Maple Unit Block Sets to other Unit Blocks Sets. 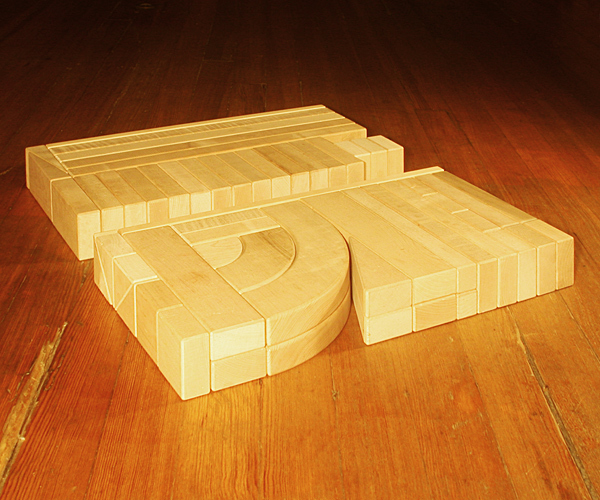 Our CP01 plus CP03 equals our own CP11 Introductory Family Unit Blocks Set (96 blocks, 16 shapes) made with FSC®-Certified Hard Maple. Compare these unit blocks sets to Community Playthings F151 Introductory Set (92 blocks, 16 shapes), which is now made from cheaper, grey-colored Soft Maple instead of true Hard Maple. Our CP02 equals our own RX10 Quarter Classroom Rx Unit Blocks Set (55 blocks, 11 shapes). They are identical, made with FSC®-Certified Hard Maple. Our CP01 + CP03 + CP04 equals our own CP31 Preschool Center Unit Blocks Set (150 blocks, 20 shapes) made with FSC®-Certified Hard Maple. Compare these unit blocks sets to Community Playthings G431 Preschool Set (149 blocks, 20 shapes), which is now made from cheaper, grey-colored Soft Maple instead of true Hard Maple. Our CP01 + CP03 + CP04 + CP05 equals our own CP61 Quarter Classroom Unit Blocks Set (190 blocks, 20 shapes) made with FSC®-Certified Hard Maple. Compare these unit blocks sets to Community Playthings G461 Quarter School Set (180 blocks, 20 shapes), which is now made from cheaper, grey-colored Soft Maple instead of true Hard Maple. We use only durable, infant-safe Hard Rock Maple for our unit blocks for your home — never imported, chemically treated rubberwood or other soft hardwood. We cut each unit block to within one-half of one hundredth of an inch of standard unit block dimensions and round all edges for safety. We exceed CPSIA requirements. We make it easy to upgrade. You can start with a smaller set for your home to meet immediate needs and upgrade whenever you wish. 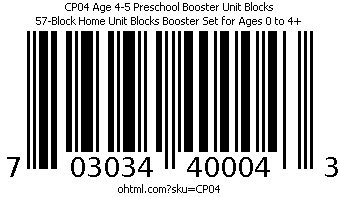 For an infant, toddler, or preschooler, start with the CP01 Infant Toddler Standard Unit Wooden Block Starter Set, the CP11 Introductory Family Standard Unit Wooden Block Set, or the CP31 Preschool Center Standard Unit Wooden Block Set and upgrade in easy, affordable steps to meet your budget. Standard unit blocks in traditional hard rock maple are the classic educational toy — the perfect addition to your home. 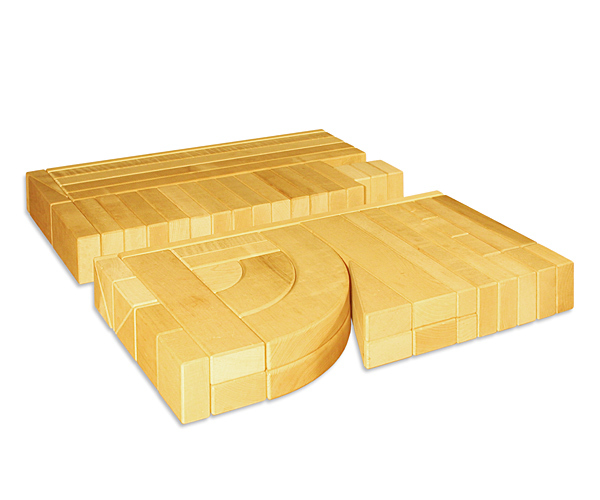 With sensible care, your set of Hard Rock Maple Unit Blocks will last generations and increase in value. For home-based childcare, unit blocks are the one piece of play and learning equipment that meets the needs of all ages, from infant through elementary school. Pay attention to the number of children you expect to play with these blocks simultaneously. Each booster set (CP02, CP03, CP04, CP05) adds blocks for an additional child and also supports age-appropriate play and additional dramatic and creative play possibilities home or home-based childcare. Our CP11 Introductory Family and CP31 Preschool Center wooden block sets include enough unit blocks for multiple children. Current as of 9/23/17. Please call if you have questions about how to buy wooden blocks for your home, wooden blocks for babies, wooden blocks for kids, or wooden blocks for older children. We’ve taken an American education standard — the Unit Block — and provide a better block for your home — locally-made, sustainably produced, precisely and lovingly made, and ultimately safer for our children. This item (CP04) weighs approximately 40 lbs. / 18.2 kg for 2 boxes. Each box contains about 20 lbs / 9.1 kg of unit blocks.